On 10th October Owen Parker (Politics, Sheffield) and Monica Clua-Losada (Political Science, Pompeu Fabra) organised a small workshop under the auspices of SPERI and the JHU/UPF Public Policy Centre, on the theme of ‘Rights and the Crisis in Europe and Spain’. 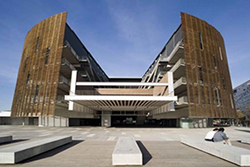 It was held at Pompeu Fabra University, Barcelona, and funded by a Santander Research Mobility award. The workshop focused on four papers/projects, all of which in some way explored the ways in which rights – broadly conceived to include social, economic, civil and political rights – have been eroded or sidelined during the European crisis and/or the forms of political and social resistance which have emerged in that context. The papers drew on empirical research on: the evolution of the welfare state in Europe (Luis Buendia); the nature of fundamental rights protection at EU level and its recent absence (Robbie Pye); social movements in Spain and Britain during the crisis (Monica Clua-Losada, David Bailey and Nicholas Huke); and EU citizenship and the plight of Roma intra-EU migrants (Owen Parker and Oscar Lopez Catalan).